This Yachtsman Steakhouse recipe is a twist on the American classic; using lemon cornbread instead of the traditional angle food cake. The contrast of the lemon cornbread's citrus flavor to the sweetness of the strawberries is a nice surprise. 2. Combine remaining strawberries with puréed mixture in a large mixing bowl. Set aside to marinate. 1. Preheat oven to 300° F. Grease and flour 13 X 9 X 2-inch baking pan. 4. 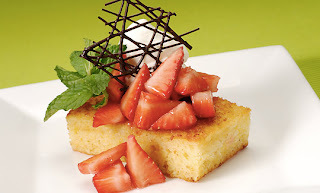 Top cornbread square with Grand Marnier strawberries, then top with whipped cream, crème fraîche or vanilla ice cream.